Generalizing the motto on the website of the network created to support soldier Bradley Manning (Exposing war crimes is not a crime!) I am here to say that exposing crimes is not a crime. More than ever, when we see the great rising importance of the net in the world, this principle must be defended. That is a fundamental and determining principle everywhere, as in the fascinating revolution that is occurring in real time in North Africa. In my Italy it is daily attacked too. It will be never needless to say: publishing rumors is gossip but making known to the people the crimes of those who govern is Journalism. Journalism with a capital J. Every referring to the Berlusconi 'Bunga Bunga' and Ruby case is wanted. Bradley Manning is a US young soldier and information theory expert imprisoned since 282 days in solitary confinement at a military prison in Quantico, Virginia. He is accused of downloading thousands secret files, sending them to Wikileaks. Bradley risks the death penalty. Now, you have to know that among them there is a video called Collateral Murder, which I already wrote about last year on this blog. In it there is evidence of the murder of a dozen civilians by two U.S. military helicopters. I think that who intended what precious right is at risk at this moment, here, in the world and on internet, must raise their voices and efforts to prevent it from being smothered. 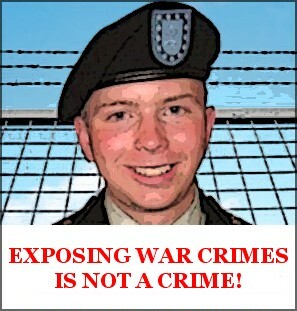 That is why I ask that the soldier Bradley Manning is released soon. I am with Bradley because exposing a crime is not a crime. The silence is a crime. Under the shadow of silence, everything can be said and anything can be done. Hidden by that veil, some might even convince the others that a war can be a peace mission. Hidden by that veil, civilian deaths are just casualties. Hidden by that veil, even murderers are celebrated as heroes. And hidden behind that veil, all opponents are necessarily traitors. Nevertheless, I am with Bradley, because exposing a crime is not a crime. The betrayal of those who do everything to prove otherwise is a crime. The brave men are less than the coward ones. The former, at the moment they demonstrate their value, in most cases are alone. The latter almost always express their cowardice in the crowd. And so they cry, cry out loud, eager to hold the light of truth with the spots of their unacknowledged shame. Still, I am with Bradley, because exposing a crime is not and never will be a crime. It is a gift to others. It is a gift to all the brave as the coward people. However, not everyone is ready to open that present box. To engage and provide support, here and here. The News: The soldier Bradley Manning could be sentenced to death.